Ujamaa To build and maintain our own stores, shops, and other businesses and to profit from them together. If my statemeant is wrong, feel free to list examples of “Cooperative Economics” in the comments! “Cooperative Economics” goes way beyond “collaboration”, the latter suggests working together for individual gain… Cooperative economics suggest putting aside purely self related issues… which is where many have a problem. 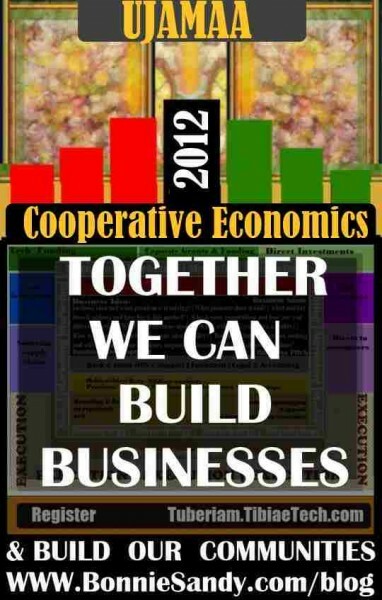 Cooperative Economics is- Raising capital together, finding space together, marketing & distribution together, working together and splitting the profits! Another scenario, each individual adding their strength, the funding, the knowledge, the network, the concept, working these together and splitting the profits. Ujamaa To build and maintain our own stores, shops, and other !businesses and to profit from them together. We have few stores or shops, WHERE WE CAN BE FOUND TOGETHER few that we have built , or operate TOGETHER, offline or online, and we sure as hell have few businesses we profit from TOGETHER! It’s 2012 time to admit WE DO NOT LIVE OUR PRINCIPLES… Ujamaa is simply a word we recite on December 29th each year! Working together and splitting the profits… that means everyone has to understand what “work” needs to be done! Everyone need to be keep abrest of “Profits”… which means proper book keeping and reporting! I believe it can be done! Most importantly it is a revenue models that allows us to profit together! When I wrote these original posts in 2009 I was essentially taking a fresh look at “what is” and asking myself “what can be” in the process I identified a series of issues I was not comfortable with! Three years later I am about to launch a solution and still reflect on the real issues! Ujamaa To build and maintain our own stores, shops, and other businesses and to profit from them together. I’ll be honest I’m not to sure about this one! Cooperative Economics goes way beyond collaboration which suggestion working together for individual gain… Cooperative economics suggest putting aside self and working together and splitting the profits! I’m not sure if most of us can do that! It means understanding that everyone’s input has value! Just getting credit for the images that photographers have helped provide has been a challenge! A designer recently spoke of walking into a local Bedstuy boutique and being assured by the proprietor that they were the designer of an item that was distinctive to her company! WHY? In a society where being a “mogul” and scoring the big “Catch” seems to be the end goal how can we share info that may jeopardize that chance! I did not post this yesterday; I could not admit that I have little faith in this principle. I am not saying it does not exist, lately, I have seen little of it in practice! Admittedly I have not been around much; In 2009 I decided to focus on the 80/20; that is put 80% of my effort to the 20% of activity that showed results! I am keeping an eye on Society HAE They seem to be doing some sort of cooperative economics yet I have not asked Ngozi directly! If so I applaud them! May I also recommend their NYE Bash (2009) as a solution! I also had to ask myself about my responsibility, while I have conducted this voluntary project I abstained from a formal economic platform, I am the mother of a seventeen year old high school senior. I needed to be home when he arrives, or more correctly to ensure he arrives home as he should! As he gets ready to graduate I can now look towards a formal entrepreneurial venture! I have been considering an cooperative economic format, we’ll see! Posted in Latest and tagged As I See IT, Kwanzaa, Latest, Tibiae Tech.